The material : Ceramic is made from enamelled clay, baked at a high temperature. It is resistant to the development of germs or bacteria. Ceramic offers great mechanical resistance, high durability and high resistance to wear. 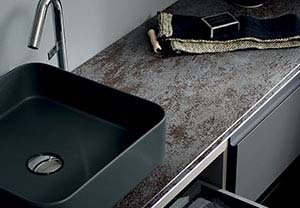 As a neutral and amorphous material, ceramic is safe for people and for the environment. Ceramic has a natural look. Maintenance : do not use abrasive or aggressive chemical products (hydrochloric acid, anti-rust type products...) After each usage, clean with a sponge and soapy water (household soap such as savon de Marseille or clear dish washing liquid). Avoid placing tea pouches or coffee filters on ceramic surfaces for extended periods of time. - pencil, pen : use 90° alcohol. - Nail polish : nail polish remover. You can also use spirits (turpentine) or white spirits (paint thinner) in small doses, while rinsing well and wiping your surfaces in all cases. 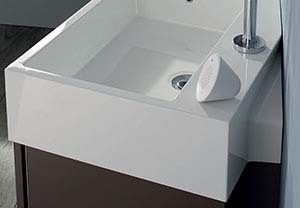 The material : Material made of marble powder mixed with polyester resin and covered with a gelcoat (thickness 1 mm), moulded as a single part, including the basin. It has a uniform appearance, is soft to touch and easy to maintain. It is perfectly hygienic and totally sealed. Daily maintenance : Clean with ordinary liquid detergent. Warning! Do not use any detergent that contains an abrasive substance. Do not expose the product to acid, to eosin, to scouring products that contain ammonia, to hair colouring products or to bleach. The material : The material Sulphate mineral stone. The material absorbs condensation and heat, it does not freeze and maintains temperatures. 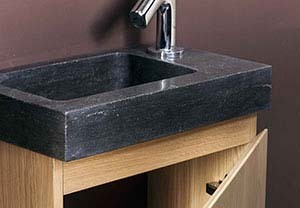 Natural limestone is odourless, non-toxic and it contributes to the eco-environment. The basin has been carved from a solid block of limestone. 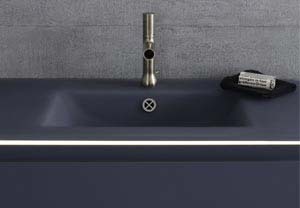 Daily maintenance : Do not use detergents, abrasive acid products (vinegar, hydrochloric acid...), that would damage the finish of the basin's surface. Clean with a soft damp cloth and water, then wipe thoroughly. Specific stains : Minor scratches can be removed by polishing with a gentle polishing product. 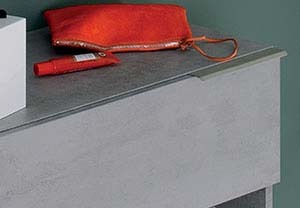 Should the surface becomes scratched or lose its shine for any reason whatsoever, contact your retailer. The material : transparent material, hard and fragile, manufactured from sand and potash or soda. Glass is resistant to the development of germs or bacteria. Daily maintenance : clean with a cloth like any glass surface. The material : Material based on natural products, clay, granite, ceramic pigments resistant to solvents and current detergents. Resistant to stains, scratches and wear, easy to clean. Stable colours, UV-resistant Suitable for damp locations, and resistant to climatic variations. Daily maintenance : only use soapy water and a sponge, and dry with a soft cloth. 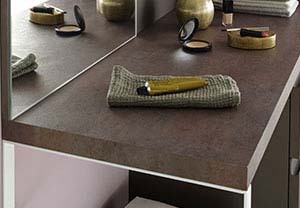 The material : Laminate is a material made of superimposed layers of kraft paper, finished with a sheet of décor paper. The laminate is thin (from 0.6 mm to 2.3 mm), and is intended to be glued onto a particleboard panel. It can be post-shaped. Its surface is non-porous, and is resistant to humidity, heat, UV and abrasions. It is a worthwhile product for its "materials" effects ». Maintenance : cleaning with ordinary non-abrasive products. Do not use waxing products. The material : Varnish made from resin. 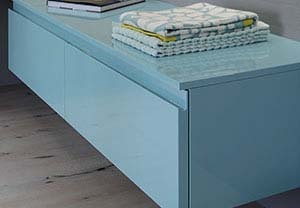 Lacquer is available in 3 different finishes, glossy, satin or soft. We use polyurethane lacquer. Over the course of the years, the shade can change slightly due to the effects of light (UV rays). Do not expose the unit to eosin, ethanol or disinfectants (Dermaspray type), nor to nail polish remover. 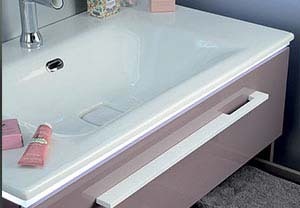 Daily maintenance : Only use soapy water or a glass-cleaning product with a sponge, and dry with a soft cloth. The material : lParticleboard with a melamine surface uses a sheet of the decor paper glued onto a wooden particleboard (shredded wood fibre, compressed and glued).Its surface is non-porous, and is resistant to humidity, heat, UV and abrasions. It is a worthwhile product for its "materials" effects. Melamine can nevertheless be damaged by excessive humidity. 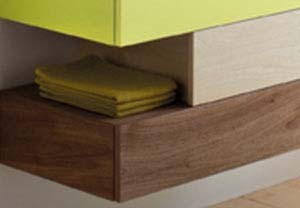 Daily maintenance : Clean regularly using kitchen towels, a soft cloth (dry or damp) or a sponge (if damp cleaning, wipe thoroughly). The repeated use of furniture maintenance products or waxing products can result in the formation of a sticky and unpleasant layer. The material : This is a panel of wood MDF (Medium Density Fibre Board), covered by a thin veneer of stained and varnished wood that determines its appearance. 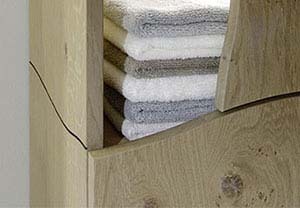 It's a natural material, meaning that each piece is unique and differences in shades cannot be considered as defects. Unlike a piece of solid wood, veneer will not change shapes but has a tendency, like any wood, to become patinated over the years due to light (UV rays). - Specific stains Recent stains or food stains : nettoyer avec un chiffon doux imbibé d’eau savonneuse. Clean with a soft cloth and soapy water. Then dry using a soft cloth. - Traces of pen or marker : ink 90° alcohol or methylated spirits, lemon juice, commercially available anti-rust product. Before using, test on the part of the unit that is not visible. - Nail polish : Use a nail polish remover that does not contain acetone, but do so carefully and while using a cotton swab in order to limit the application. Before using, test on the part of the unit that is not visible. The material : Solid wood protected by a special anti-UV varnish. Smooth and pure to the touch. This is a living material, meaning that each piece is unique and differences in shades cannot be considered as defects. "Fraxinus" ash Wood with a pinkish yellow white tone, with a fairly coarse grain and straight but sometimes wavy lines. The ash wood used by SaniJura comes from the Poligny forest, "100% made in Jura". It therefore has a low "ecological footprint", since it is produced locally. "Stalk" OAK Wood with a yellow white tone, with a coarse grain and straight lines. The oak used at Sanijura is from 100% French oak trees, and is recognised for its durability and brilliance. - Specific stains Food stains : clean with soapy water, rinse and dry using a soft cloth. - For greasy stains : Terre de Sommières stain remover is the right remedy. - Traces of pen or marker : ink 90° alcohol or methylated spirits, lemon juice, commercially available anti-rust product. - Nail polish : Use a nail polish remover that does not contain acetone, but do so carefully and while using a cotton swab in order to limit the application. Before using, test on the part of the unit that is not visible. .